NEARLY A YEAR after the brutal shooting deaths of nine black parishioners at a church in Charleston, South Carolina, the US Justice Department has said it will seek the death penalty against the man facing federal hate crime charges for the killings. The decision means that both state and federal prosecutors are seeking the maximum penalty against Dylann Roof (22) for the 17 June Emanuel AME Church shooting. The killings contributed to a national conversation about race relations and ultimately led to the removal of a Confederate battle flag from the grounds of the South Carolina State House. 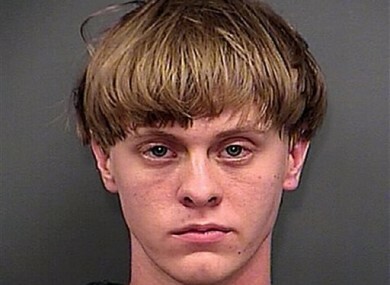 Roof faces nine counts of murder in state court, and solicitor Scarlett Wilson has said she wants to try her case first. That trial, originally slated to begin this summer, has now been pushed to early next year. Wilson announced her decision to pursue the death penalty in September. But the possibility of a federal death penalty case has loomed over the case even longer, ever since the government announced a month after Roof’s arrest that he would face hate crime charges. Prosecutors said he was motivated by racial hatred and a desire to commit a “notorious attack” when he opened fire inside the church, “to carry out these twin goals of fanning racial flames and exacting revenge”. Roof was arrested a day after the shootings in North Carolina when a motorist spotted his Confederate license plate. Roof appeared in photos waving Confederate flags and burning or desecrating US flags, and purportedly wrote of fomenting racial violence. Survivors of the shooting told police that he hurled racial insults during the attack. One said Roof told her that he was “letting her live so she could tell what happened”. There’s no timeframe for Roof’s federal trial, and an attorney meeting is scheduled for next month. Though the Justice Department says it’s committed to seeking the death penalty, federal executions are exceedingly rare. The last time a federal defendant was put to death was in 2003. And President Barack Obama has said he’s “deeply concerned” about the death penalty’s implementation. “The nature of the alleged crime and the resulting harm compelled this decision,” Attorney General Loretta Lynch said in a brief statement yesterday , adding that the department had considered “all relevant factual and legal issues”. Roof’s attorneys in the federal case have said their client would be willing to plead guilty if the death penalty was not on the table. Defence lawyer David Bruck said he had no comment on the federal decision to seek the death penalty. Both state and federal prosecutors have spent time consulting with relatives of the shooting victims over the pursuit of the death penalty. At his initial appearance before a judge after his arrest, some family members said they forgave the alleged shooter and that they would pray for him. Malcolm Graham, brother of shooting victim Cynthia Hurd, yesterday said federal prosecutors had talked to family members before announcing the decision and that he felt it was “an appropriate punishment”. Email “US prosecutors are seeking the death penalty against this man”. Feedback on “US prosecutors are seeking the death penalty against this man”.